Lakes formed from aggregate abstraction can be very sheer sided. 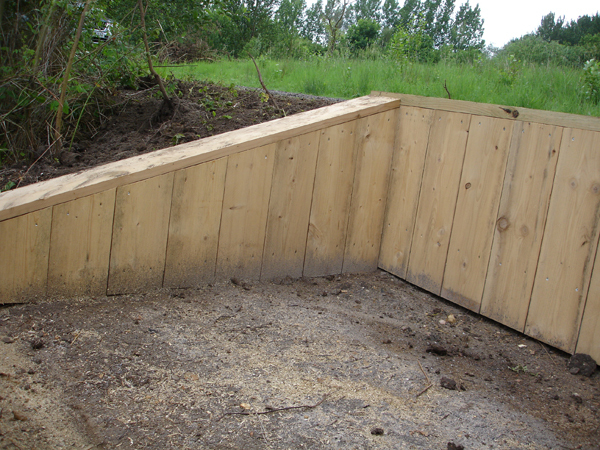 To prevent slumping of material we install retaining walls constructed from a variety of materials such as railway sleepers, butted posts or synthetic protrusions. These can be stacked and fixed, or driven in close, butted against one another. Rock Gabions and Mesh Cages offer a solution where strength and stability is key, providing superb long term defence for larger scale projects. They have benefits in both aquatic and terrestrial bio-engineering situations. We utilise traditional, living materials as a very effective form of erosion defence, especially when combined with modern aquatic bio-engineering advances.